We are pleased to announce the launch of our inaugural product line: the Virtual Confederate line of applications. The Virtual Confederate line is targeted to the scientific community. We have trained our Virtual Humans to play roles in experiments that require additional people controlled by the investigator, i.e. to work as confederates. The Virtual Asch Conformity application is setup to allow variations on the classical setup. 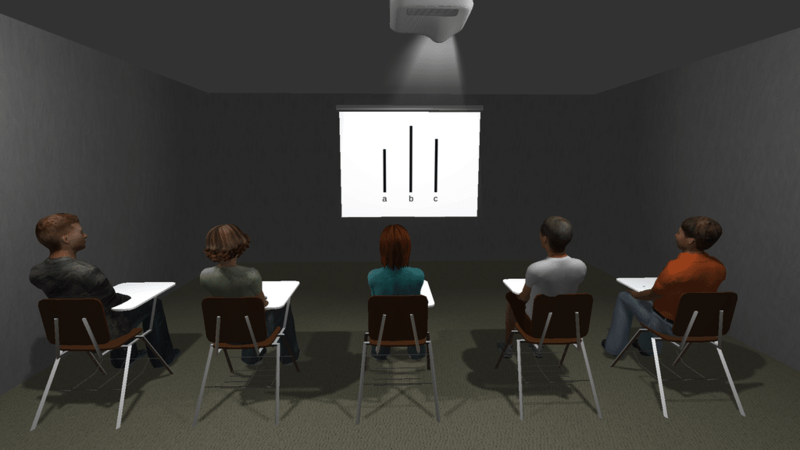 Adjust the number of ‘participants’, seating orders, change response, include our own stimuli. Our virtual confederates respond consistently even in the experimental critical trials. A virtual Trier Social Stress Test. Our Virtual Confederates form the panel. No contaminantes occur, as the Virtual Confederates deliver thier response and guidence consistently and without unplanned emotional content. Via lipsync technologies you control what is said and can even use live lipsync to handle any issues that come up. Want to go beyond these bounds? We can adapt what we aleady have or create something new to fit your needs within this product line.